How nurses can stay positive and focused in high stress environments. Tony Schwartz, founder and president of The Energy Project (theenergyproject.com), an organization currently launching a project to improve the nursing work environment, and co-author of The Power of Full Engagement, says that nurses are by nature better at caring about others than they are at caring for themselves. Isn’t it time to start caring about your own health? In this exclusive RealityRN interview, Schwartz discusses how nurses can manage their energy for greater effectiveness at work, a healthier lifestyle, and more personal satisfaction. RealityRN: What do you mean by “renewal and recovery” as it relates to one’s personal energy? Tony Schwartz: “Renewal and recovery” is about shifting your focus from time management to energy management. Time is finite, but energy can be expanded and renewed. Through The Energy Project, we’ve learned that people who truly disengage can recover their energy in a much shorter time than you might guess. So, it’s like being physically fit. Yes, the way to energy is fitness. After critical research, we’ve concluded that there are three important forms of fitness: physical, emotional, and mental. When you’re emotionally, physically, and mentally fit, you’re at your peak, able to operate on a very high level. You train yourself to recover. What can nurses do during their shifts to recover energy? There are a number of options including breathing, changing your story around, eating, and exercise. It is amazing what a moment of deep breathing can do for you. When you’re running around in a state of hyper-alert – a.k.a. survival mode – you’re prone to breathe in a very shallow way. So take a moment and stop: breathe through your nose to a count of three, and breathe out through your mouth to a count of six. You’ll end up in a less energy-draining state. What do you mean when you say nurses can change their stories? While on your shift, you’re guaranteed to enter an emotionally negative state –something is going to upset you. But before you let yourself throw a fit, stop and ask yourself, “What are the facts, and what is my story?” You can’t change the facts. What happened, happened. But you can change the way you look at the situation. Perhaps a doctor snaps at you, and you feel degraded. You are about to let the emotions well up inside you, but you pause. Fact: What the doctor said was cruel. She’s having a bad day and didn’t mean it. Story: She’s a jerk, but maybe she’s right. I’m not worthy of respect. If the doctor has no respect for others, when you have your story right, she won’t undermine your personal value – you won’t give her that power. Either way, you have the ability to choose the story that allows you to get that smile back on your face. Why do you mention eating when it’s an obvious and regular behavior? Nurses know that glucose levels are important, but there are plenty of reasons why they don’t eat healthy and regularly. Often, there are rules against food on the unit or nurses don’t take breaks if it’s a really busy shift. You can’t count on the external environment to solve your problems for you, so if they’re getting in your way, you have to find a way to deal with it. I suggest creating a ritual: a behavior that you do in a precise way at a specific time in an effort to make it a regular act as quickly as possible. It’s important that you don’t go more than three hours without eating on every shift. Stuff a handful of nuts in a plastic bag that you can get to. Put a protein bar or fruit in your coat pocket. Eat just before your shift. But whatever you do, stick to it. You’ll feel the difference. Rituals are important for sustaining fitness in all three areas: mental, emotional, and physical. 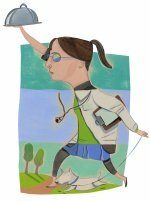 How much exercise does a nurse need to stay physically fit? You don’t need to run five miles every day. A small amount of physical activity can do the trick. Not only is a bit of physical movement good for you physically, it prompts mental and emotional recovery as well. Doing something as simple as getting off the bus a stop earlier and walking to work allows the tank to refill so that you can focus. These are very good tips and important to stick too! It takes work, but I’m going to try really hard to apply these principles to my day! These are very good tips. One of the things that I teach to young nurses is : When the shift you are on is the busiest one you think you have ever worked it is important to schedule yourself a 15-minute break” I know, I know how can you find time for a break? But just 15 minutes away from the busy chaos and you will come back rejuvenated and ready to tackle the rest of the shift. It works! Try it!